The comfortable BTW hostel is quite an established winter meet location, being accessible even in the icy grip of Beasts from the East and we still ended up with a full house, with road conditions not nearly as bad as feared. Extra boots are now required for the short walk from the hostel to the drying room, which is no longer inside the main building. Claire H and Kenny caught the early bus from Glasgow on Friday and met up with Fiona M who’d kipped locally in her car to avoid planned horrific driving conditions. The 3 of us climbed Centigrade on Beinn an Dothaidh, which was Claire’s introduction to multi-pitch winter climbing (whooo!!) and part of Fiona’s gentle easing back into life with a neck brace post-bike accident (Oct 2017). Saturday had a pretty poor forecast, with wind and sleety rain and a considerable thaw. A number of folk headed out direct from the front door: Matt, Sinead, Fiona C, David T and Fiona M fought their way up through a forest and went up Fiarach. Claire, Tony B and Keith found a nice line on Beinn Chuirn above the Cononish gold mines. Marcus, Tim and Sylvian headed out early doors to climb Salamander gully on Beinn an Dothaidh; Mike, Fiona R, Alison C and Kenny all headed off with snow shoes. Alison and Kenny did the Corbett Beinn Chaorach. 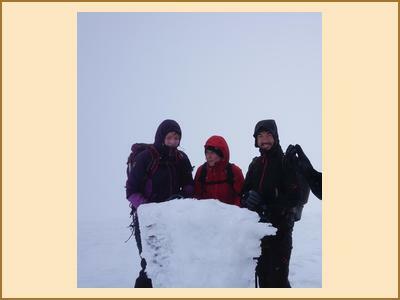 Mike and Fiona R did Beinn Challuim via it's NW ridge and a slightly esoteric grade I route. Meanwhile a huge group of Kate, Allan, Alison F, Harsh, Julian, Alan, Anne, Martha, Chris R (original) and Chris R (mkII) were on a very snowy Beinn Challum. There was much chatter in the communal lounge in the evening, and everyone was sleeping nicely when the fire alarm went off! The custodian turned up after half an hour or so and was welcomed by Sylvian who was in his pants. What A Man. Clearly impressed, the custodian not only switched off the alarm he also kept a vigil outside in the snow to make sure that when the alarm went off again (which it did, circa 2.30am) it could be silenced again. Fiona R apparently slept through the whole thing. On Sunday the sun made another appearance to the south, and Martha, Claire H, ChrisxChris and Julian had a long walk and lots of hollering and tomfoolery on Creag Mac Ranneach (above Lochearnhead), testing their winter ironmongery in the process. Kate, Allan and Fiona C went up Beinn Each, and Harsh joined them for a bit before turning back. 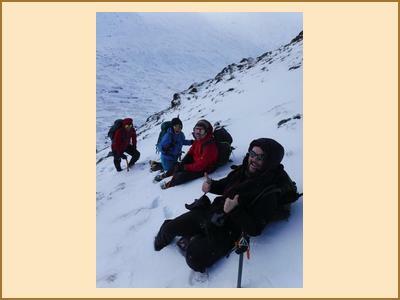 Alison, Kenny, Fiona M and Mike and Fiona R climbed Salamander gully while Tim, Marcus and Sylvian climbed centigrade. A fair number of others headed straight back to the ‘burgh. Apologies, it’s a few months since the meet and I can’t recall what else was achieved that weekend!